She laughed and shook her head as she unrolled the clingy plastic from around her slug-shaped sandwich. Down below, raucous teenagers gamboled in a spring that seemed to be the source of the river along which she and her companions had hiked all morning. She laughed at how easy it had been not to think about it, how well her plan had gone. Her companions were no longer visible ahead. Soon they’d wonder about her and send someone back in search. In the meantime, she’d have something to eat. The rains had not yet come, yet the Tzipori River had flowed gently but surely along its terraced channel as they walked beside it that morning. At one point it bowed and nearly circled a low hill on which a tiny village perched. Children played in a schoolyard. The leader had given the village a name that she could no longer remember. Further on was an old millhouse that you could now rent out for weddings and bar mitzvahs. There the trail had crossed the river (all of three meters wide) and she had followed the others over half-submerged stones. The water, which the leader said was partly sewage, washed over her boots. Last to cross, she had probed the riverbed with her poles to steady herself. She thought of turning back but did not. She hadn’t hiked seriously since her teenage scout years, which were three decades past by now. Back then, at tough spots, like the river crossing, the boys were always ready and eager to help. Some were very serious about it, as if pulling her up a boulder or guiding her over a narrow spot in a path above a canyon was the very reason that they had been placed on this earth. Others had laughed at her fears, in a big-brotherly way (she was the oldest in her family, and had always wanted a big brother). In this group, today, the others were obliging but cool. She signed up for the hike because she knew it would be good for her. She didn’t need a psychologist to tell her that sitting at home and brooding would only cast her deeper into her abyss. And while her friends were sympathetic and always ready to lend an ear, she felt she needed to get away, to be with people who did not know her story, who could see her as she was, that is, as she had been, as she was now but for that. Getting out into nature also seemed like a good idea, getting out into nature, that is, without a hundred screaming twelve-year-olds, as she did when she chaperoned the fifth and sixth-grade class trip each year. So she looked on the Nature Protection Society website and found a Saturday hike, one in the category of the not-so-difficult, but long enough, at several hours, to ensure that families with small children would mostly likely not sign up. The late November morning had not yet dawned when her alarm woke her up. The room was freezing and she quickly slipped into the old pair of pants, tee-shirt, and sweatshirt she’d placed ready on her bedside table. She washed her face at the kitchen sink and turned on the electric kettle. As it boiled she opened the refrigerator to remove the sandwich and bag of vegetables she had prepared the night before. She’d talked to the leader on Friday just to make sure she was properly equipped and he had said to bring half as much food as she thought she’d need. So all she added to the refrigerator stash was a small plastic box filled with raisins and walnuts. Two empty Nestea bottles filled with water, hat, sunscreen, and extra pair of socks were already in the small backpack she always used for school hikes. There’d still be room to stuff in the sweatshirt and jacket when the day grew warmer, as it was supposed to do. She ladled a heaping spoonful of Tasters Choice into her thermos cup, poured on the boiling water, added milk, stirred, and screwed it shut. Then she took her bag, opened the door, closed it behind her quietly, and locked slowly, so as not to wake up those who were still sleeping. It took her nearly two hours to reach the meeting spot, the shopping center next to Kibbutz Yagur, at the foot of Mt. Carmel (she’d taken a wrong turn at Yokene’am and got caught, thankfully briefly, in morning traffic). The group was all she had hoped for. The leader was a thirtyish wiry outdoors type with a ratty Australian hat over his disordered curls. There was an older, white-haired couple who spoke English with a German accent and who looked like they had scaled many an Alp together in their time. A trio of energetic and talkative women with guttural hets and ayins explained that they’d been doing this for years to get some time away from their husbands and homes. Finally, a quiet, morose looking guy of about 40. The leader had everyone say their names in sequence, and she immediately forgotten them. He made sure they all had enough water and money to take the bus back from the endpoint of the hike, then had them get back in their cars and drive a short ways after him to the trail head. The section of the Israel Trail they were walking passed first through a moshav, then headed out into the wild, up an incline into hilly terrain where occasional olive groves appeared in the midst of the wild meadows. She chatted with her companions and it was entirely natural for her not to tell them why, in fact, she was with them, and even when they asked her about her family she didn’t even have to think first before formulating an answer that elegantly avoided the thing that she had chosen to leave out of this adventure. But the others were in better shape than she was and she soon found herself falling behind. Every so often they would wait up for her but, increasingly, she walked alone, a few dozen paces behind them. At one point they disappeared around a spur and she felt a pang of fear of being left alone, but as soon as she rounded the bend herself she saw them standing and admiring a large and low-branching oak that stood like a shrine in the center of a triangular plateau between two hills. It was a venerable tree that had cast many acorns on the grass, where a few early lavender-pale cyclamens were flowering. The trunk was knurled and had a large cave-like crevice lined with smooth bark that looked like a pair of lips. 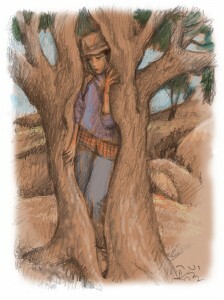 As the others gazed, she cast down her poles, strode over to the tree, and inserted herself into the opening. Her hips were really too wide, but, laughing, she managed to get in almost up to her waist. The others laughed, too, except for the morose man, who looked the other way. The leader asked how it felt and told them about dryads, the nymphs that resided in oak trees, but lived only so long as their tree did. For the ancient Greeks, he said, chopping down an oak tree was tantamount to bringing a horrible curse down on oneself, as in addition to killing the tree you were killing the dryad. She told them that she indeed felt herself to be an integral part of the tree. As if they were one flesh, as if she were herself a branch and about to sprout acorns. The leader urged them to move on as there was quite a way to go still. The sun was now high in the sky, so she removed her sweatshirt and stuffed it on top of the jacket in her backpack before they descended into the river valley where rippling water harmonized with birdsong. They remained together until the river crossing, when the others again moved ahead of her until she could barely see them in the distance. And so she decided it was time for a break and let them come back and find her. A girl screamed in the spring below and two boys shouted back and forth. After eating half of her sandwich, she opened up remaining half and ate it as she used to eat the ones she took on scout hikes—picking out first the pepper and cucumber, then eating the cheese, and finally each side of the roll, one after the other. The sun had gone behind a cloud and she thought of putting her sweatshirt back on, but once she began walking again she’d warm up, so it probably wasn’t worth it. Out of the corner of her eye she caught sight of a figure down the path, just at the bend far ahead where her companions had vanished. She did not look. It waited there a moment, then began to walk toward her. She gazed down at the spring. She soon saw that it was, as she expected, the leader, who called out to her. She turned her head to look at him but did not get up. He approached and called her the dryad asked if everything was ok and if she needed help. She laughed and said everything was just fine, she had just needed some rest and refueling. The girl down at the spring, or maybe another girl, screamed again. He held out his arm and she grabbed it and he pulled her up from her rock. Hadn’t it been nice, he asked, back then in Greece, when a lonely wanderer could stop by an oak tree and have a chat with a nymph? And back when a nymph could be so much part of a tree that they died together, she replied, wasn’t there something wonderful about that as well? He looked at her strangely, and then agreed that there was. They walked on and rejoined the group, where she told them all about her sandwich, and the spring below, but nothing about why she had come. Which felt perfectly natural.